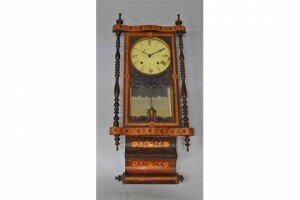 A Regency ebonized and gilt heightened mantel clock by Robert Roskell, Liverpool, the case of moulded rectangular form with wreath form and urn embossed carrying handles and grilled metal side panels, on plinth base with ball feet, the white painted dial with Roman numeral chapter ring and gilded pierced hands. 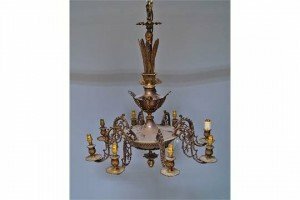 An eight light brass chandelier, 20th century, with stiff leaf corona, above urn form central pillar, emitting pierced scrolling arms terminating in foliate moulded sconces. 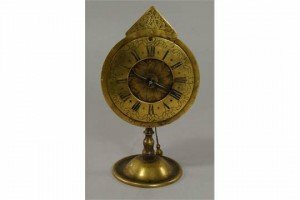 A brass table clock, in the 18th century style, the face with Roman and Arabic numeral chapter ring, with floral centre piece and single hand, on a turned support with spreading base, the open verge escapement behind, with spring movement and bob pendulum. 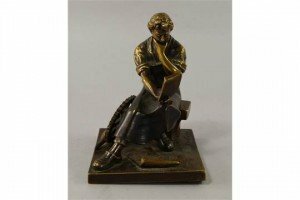 A bronze model of an Engineer, modelled seated reading plans, with a cog and tools to his side, signed to base Fullborn. 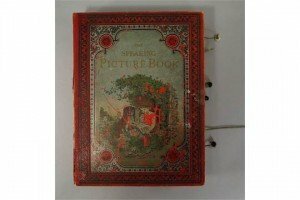 The Speaking Picture Book, a German picture book with movements to imitate animal noises, late 19th century. 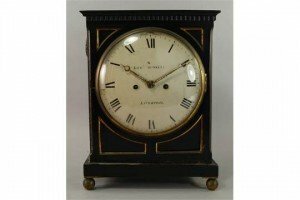 A Viennese regulator, 19th century, the case applied overall with coloured geometric and floral veneers, the white painted dial with Roman numeral chapter ring, with pendulum. 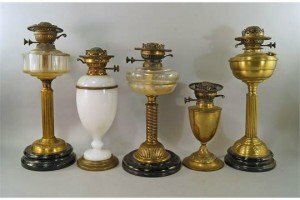 A collection of five oil lamp bases, 19th century and later, some with associated shades and chimneys, an examination lens on a stand, three electric lamps, a carriage lamp and three bayonets and a sword. 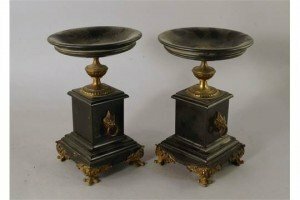 A pair of French black slate and metal mounted tazza, each urn on square plinth with beast form ring handles, on stepped plinth, with claw feet. 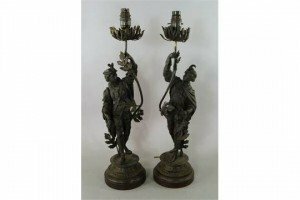 A pair of bronzed spelter lamp bases, late 19th/early 20th century, modelled as Renaissance gentlemen dressed in breeches, holding hunting trophies, holding aloft branch form lights, on turned turned bases. 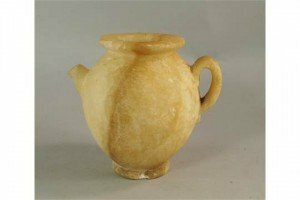 An Egyptian alabaster vessel, of Second Dynasty style, of ovoid body with short spout and curling handle. 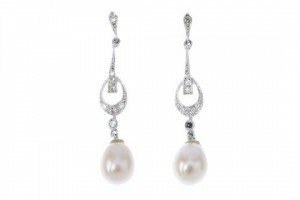 A pair of diamond and cultured pearl ear pendants. Each designed as a single-cut diamond tapered bar, to the similarly-cut diamond hoop, suspending a cultured pearl. A gem-set cluster brooch. 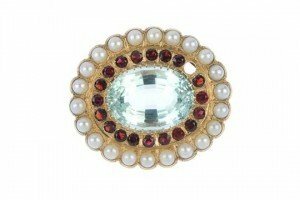 The oval-shape aquamarine, within a circular-shape garnet and split pearl double surround. A late 19th century gold pietra dura brooch. 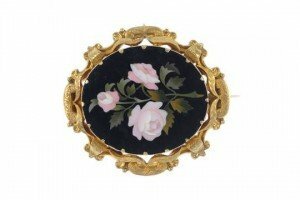 The oval-shape onyx panel, with pink rose spray, within a scrolling border. 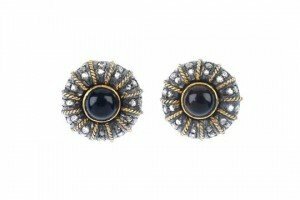 A pair of onyx and diamond ear clips. Each designed as an oval cabochon, within a rose-cut diamond and rope-twist border. A mid 20th century 18ct gold and platinum diamond three-stone ring. The graduated old-cut diamonds, to the tapered shoulders and plain band. Estimated total diamond weight 2cts. 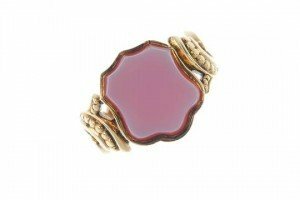 A late 19th century 15ct gold agate signet ring. The shield-shape agate panel, to the scrolling openwork sides and plain reverse. 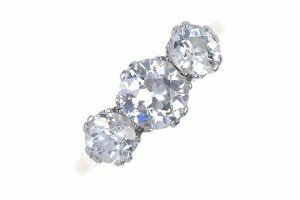 An emerald and diamond bracelet. 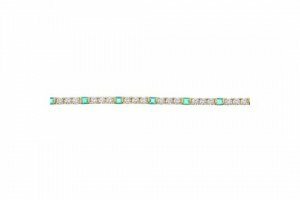 Designed as a series of brilliant-cut diamonds, with square-shape emerald bar accents, to the partially concealed clasp. Estimated total diamond weight 4cts. A peridot and diamond dress ring. Of bicolour design, the oval-shape peridot, to the floral design shoulders, with brilliant-cut diamond highlights. Estimated total diamond weight 0.15ct. 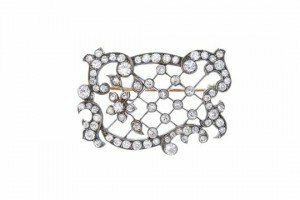 A late 19th century gold and silver diamond brooch. Of openwork design, the old-cut diamond foliate lattice, within a similarly-cut diamond scrolling border. Estimated total diamond weight 2.75cts. An amethyst and mother-of-pearl fringe necklace. The alternating pear-shape amethyst and mother-of-pearl fringe, to the trace-link back-chain.